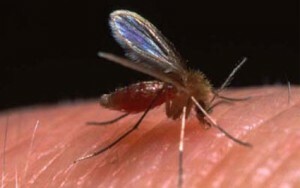 Leishmaniosis is a (sub) tropical disease caused by a blood parasite , present in Spain , which is transmitted by a mosquito and which can cause a crippling disease affecting the skin , eyes and organs and ultimately death . It affects especially dogs but also humans and cats. When clinical disease develops and detection is early enough it can be treated and controlled , but not cured and requires lifelong medication and checkups . When your dog therefore has a outdoor lifestyle which involves a lot of lying outside , especially in the evening / night , you should consider to vaccinate for Leishmaniosis. When your dog does not have an outdoor lifestyle , he should not be vaccinated , but you should still apply mosquito prevention with for instance a Scalibor collar or Advantix drops and mosquito netting . This mosquito prevention should also be continued with vaccinated dogs.